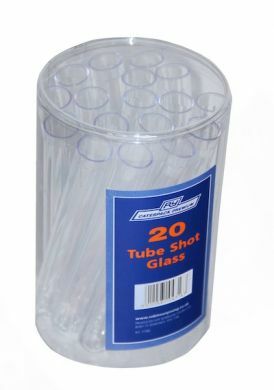 Pack of plastic test tubes with 20ml capacity. The test tubes are rimless, tapering and have a rounded base. Ideal for serving shots and molecular cocktails. The tubes are marked at 2cl (20ml) - but this is not a CE-approved mark. Will only fit our wooden test tubes rack - i.e. too wide for our plastic test tube racks. Unfortunately none of our test tube caps will fit these test tubes - hence the low price! Internal Diameter:15.6mm tapering to 14.6mm. Suitable for non-corrosive cold liquids only.